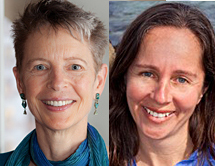 Karen Garrison and Kaitilin Gaffney worked together for more than a decade leading the effort to create, design and implement California’s 1999 Marine Life Protection Act (MLPA) that, following a long and arduous process, resulted in a world-class system of ocean wilderness parks. As of late 2012 these Marine Protected Areas (MPAs) cover 16 percent of California state waters. While working for the Natural Resources Defense Council and Ocean Conservancy, Karen and Kaitilin kept their focus on grassroots organizing.